The 16th Circuit Judicial Performance Evaluation Committee recommends that Judge Kenneth R. Garrett, III BE RETAINED. 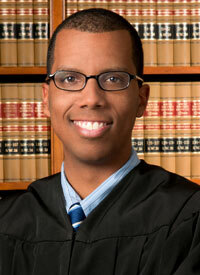 Judge Kenneth R. Garrett, III is an associate circuit judge for the 16th Judicial Circuit. Prior to his appointment, he served as an assistant attorney general and assistant prosecuting attorney. Judge Garrett received his undergraduate degree, a Bachelor of Arts in political science, at the University of Missouri-Kansas City. He also received his law degree from the University of Missouri-Kansas City. Judge Garrett is a member of The Missouri Bar, the American Bar Association, the Jackson County Bar Association, and the Kansas City Metropolitan Bar Association. He is the treasurer of the Sugar Tree Estates Homes Association, and is active in Debate Kansas City as a board member. Judge Garrett received his highest scores for: treats people equally regardless of race, gender, ethnicity, economic status, or any other factor (4.59); allows parties latitude to present their arguments (4.57); and demonstrates appropriate demeanor on the bench (4.57). His lower scores were for: effectively uses pretrial procedure to narrow and define the issues (4.30); and understands rules of procedure and evidence (4.31). Judge Garrett’s lower scores are well above the average for retention. The committee reviewed a peer survey completed by a number of Judge Garrett’s fellow judges. Again, the survey rated Judge Garrett in several categories, on a scale of 1 to 5. He received the highest scores for: treats people equally regardless of race, gender, ethnicity, economic status, or any other factor (4.86); is not affected by partisan considerations (4.71); and demonstrates appropriate demeanor on the bench (4.71). Judge Garrett’s lower scores were for: rulings on dispositive motions state reasons and consistently apply the substantive law (4.29); and maintains and requires proper decorum in the courtroom (4.29). The committee has reviewed written opinions submitted by Judge Garrett. The committee finds these opinions to be well-reasoned and clearly written.